When Instagram released Stories this past summer, it caused crippling existential panic amongst prolific Snapchatters. OK, maybe it wasn't that dramatic, but there are a lot of confused content connoisseurs out there wondering which platform is better. It's hard to tell at first glance -- the Instagram Stories interface is so similar to Snapchat, Instagram's CEO essentially admitted they wholesale copied it. But Instagram released its first major update to Stories last week, with three new features that Snapchat doesn't have: You now have the ability to create Boomerang videos, tag other Instagram users in your Stories, and verified users can link their Stories to content outside of Instagram (like YouTube videos, articles, and e-commerce sites). Still, Snapchat is not only rife with cool hidden features, there are several things Instagram Stories still haven't caught up to -- at least for now. Let's break down what advantages Snapchat Stories have over Insta. Sure, you can capture your orgiastic brunch on Instagram Stories, but you can't emblazon it with a corresponding geofilter to show off that you're kicking it in Capri. Meanwhile, Snapchat has made geofilters available for everything: ballparks and stadiums (for snapping a sick burger flip with your official Patriots-branded "sportula"), airports (for snapping your super-eventful three-hour layover in Atlanta), college campuses (for snapping the source of your future six-digit loan debt), and, of course, neighborhoods and cities. I usually have a choice of three or four Brooklyn geofilters alone, at least one of which involves a graphic of a bicycle, because it's Brooklyn. Try it out: Swipe right once you've taken a picture or video to see all available filters. Likewise, Instagram doesn't yet give you the ability to create your own geofilters. 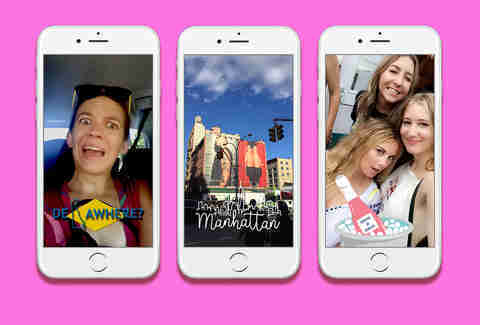 Snapchat introduced community-submitted geofilters in 2014, and started letting people create and pay for their own geofilters for events and businesses this past February. If you want to give your house party a little more social media pizazz, let the world know when you open your pizza-burrito hybrid (pizzarito) restaurant, or commemorate your engagement to Snap Inc.'s CEO, you can shell out as little as $5 to create filters of your very own that anyone can slap on their Snappage. Try it out: Here's Snapchat’s simple guide to making a custom geofilter. Sure, you can write captions for your Instagram Stories. But can you stick them onto your video scene like a virtual Post-it note? 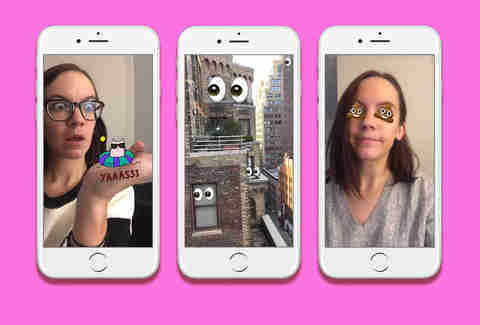 One of Snapchat's features that makes its videos look so unique is the ability to pin emojis and text, making them a three-dimensional part of the video -- for example, turning your eyeballs into hamburgers, or placing the word "DORK" on your friend's forehead. Instagram's text and emojis currently appear as flat overlays (the way Snapchat's originally were), which isn't quite as jazzy. Try it out: To pin an emoji, tap the sticker icon after taking a video, tap an emoji to select it, then tap and hold the emoji to place it where you want it in the video. To pin text, write a caption, tap the "T" icon to turn it into block letters, then tap and hold the caption where you want it in the video. Bitmojis -- they're just like you! Earlier this year, Snapchat bought Bitmoji -- a service that lets you create your own personal avatar from a menu of cartoon features -- and integrated its features into the app. You can adorn your Snaps with adorable mini-yous that express a variety of emotions, from "Yaaasss" to "I Can't Even." Seems unlikely that Instagram will cop this one anytime soon, so you'll have to look to Snapchat for your Bitmoji fix. Try it out: Swipe down to go to your profile, tap the gear icon in the upper-right corner to get to settings, then go to "Bitmoji" to link your Bitmoji account. Once you do, they'll be available in your emoji panel. Ah, lenses. 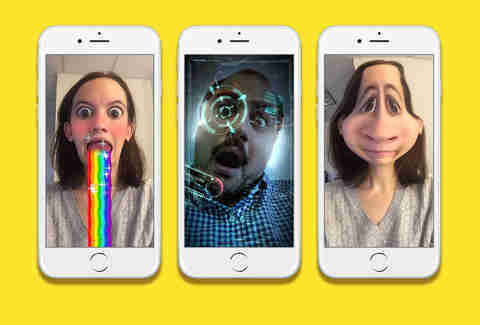 A tap of the finger and Snapchat's scary face-sensor technology turns you into a dog, a flaming hell-demon, or a misshapen troll with eyes where your chin is supposed to be. Lenses made the biggest splash in Snapworld when they launched in September 2015 -- the rainbow vomit heard 'round the world -- and it's only come up with more ways to keep your mug near the front-facing camera since then, from do-it-with-a-friend lenses to voice-changing lenses. There's nothing like this on Instagram Stories yet, but Instagram owner Facebook recently released Halloween-themed "Masks" for its Live product that turned your face into a season-appropriate witch or pumpkin, so it's definitely possible these will be on Instagram soon. Try it out: Tap the camera-flip icon or double-tap the screen to get to the selfie cam, then tap your face to access the lens menu. Beyond differences in visual features, Snap has a unique distribution advantage with its Stories: the ability to submit your Snaps to its Live Stories product (full disclosure: I used to work at Snapchat as a story editor, curating Live Stories). 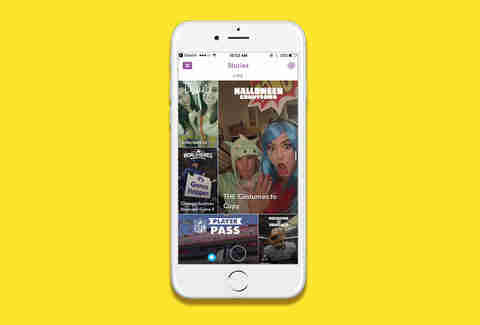 Snapchat publishes Live Stories for situations ranging from sporting events to breaking news to national food days. If you're in geographical range of the event, you'll have the option to submit your own Snap. Getting on a Live Story might not be a rocket ship toward becoming a microcelebrity (RIP Vine), but it's still worth being able to brag to your friends that millions of people saw a selfie video of you cramming a hot dog in your face at the last Cubs game. Instagram has experimented with curating reels of videos related to specific events before, so this could easily be another area they’ll delve into. But for now, community-submitted stories are solely in Snapchat territory. Try it out: When you go to add a Snap to your own Story, other publishing options for where to submit Story Snaps will automatically appear in the menu. Instagram Stories and Snapchat Stories may be similar, but the underlying reasons you use these two apps are remarkably different. Instagram is great for sharing the idealized version of your life: perfectly composed shots of hands holding food items in the air, sunset pics diffused with the gentlest Clarendon filter, Things Organized Neatly. Snapchat is messier and goofier, meant for posting shaky-handed concert videos and unflattering late-night selfies you're thankful will disappear immediately. Are we ready to show our dumb faces to the same followers with whom we share our #riseandgrind morning lattes and pristine stacks of rainbow macarons? I think not. 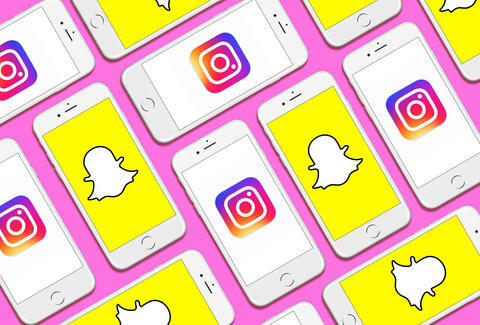 Unless you're one of the brands, celebrities, or creators who will benefit from Instagram's new proprietary feature, it's just more comfortable to take your silly, chaotic pics and videos using the more feature-rich and established Snapchat Stories. Molly O'Brien is a Snapchat associate producer at Thrillist. She will not apologize for her use of the dog lens, no matter how basic it may be. Follow her on Twitter and Snapchat @missmollymary.